As you approach the gate, you smell a cottonwood campfire. Entering the plaza, you hear the clang of blacksmith’s hammer on anvil. You are greeted by a guide in 19th-century garb muddied with adobe. Welcome to 1846! Welcome to Bent’s Old Fort! Here is preserved the site and story of a famous trading post. 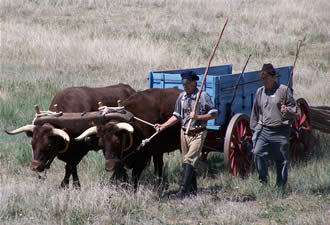 The fort was one of the significant centers of the fur trade on the Santa Fe Trail. Most of the fort's business was carried on with the tribes of the Plains including the Cheyenne, Arapaho, Comanche, and Kiowa. Built by Bent, St. Vrain & Company in 1833, the post was the center of a prosperous trading empire for 16 years. Strategically located, the fort paved the way for U.S. expansion and became an agent of change that shaped the future of the West. Today, Bent’s Old Fort is reborn: faithfully reconstructed by the National Park Service in 1975-76 on the site of the original post. 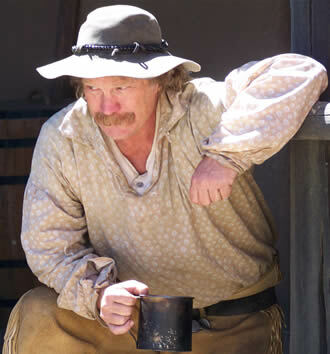 Rangers in period clothing tell the important story of this crossroads of culture. Here, the people of the United States, the Southern Plains, and Northern Mexico became linked through trade during the 1830s and 1840s. Come back in time to explore those connections. Unlike most museums, Bent’s Fort is alive. Its rooms are used by living history staff and volunteers on a daily or seasonal basis. The blacksmith hammers in his shop. Cooks toil in the kitchen. Trappers, traders and a fort doctor occupy other rooms. Visitors are welcome to wander through the rooms and become part of the historical scene. A good way to start your visit is to watch the 20-minute orientation film. You can tour the fort on your own using an award-winning self-guiding booklet or join a ranger for a guided tour. Upon completing your tour, head to the trade goods and bookstore operated by Western National Parks Association to pick up a reproduction trade item or a great book to take home with you. This is a special year for the park as it celebrates its 50th anniversary with re-enactments and programs from leading historians on June 4 -5, 2010. The event will commemorate the site’s rise from ruins to reconstruction to one of the premiere living history sites in the country. 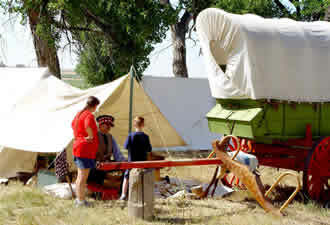 From stagecoach rides, to a trapper’s camp, to a movie retrospective, the celebration will have something for everyone. The 50th anniversary celebration will end in the fort plaza with a grand fandango, a cross-cultural party to remember the links that brought success to Bent’s Fort in the past and will carry the park successfully into the future.